Today’s Veterinary Technician supports your clinical skills, professional development, and career growth. Elizabeth Exline shares how her childhood admiration for a veterinary team put her on the path to becoming a veterinary technician. Diagnosis of demodicosis depends on identifying Demodex mites in dermal samples. Read this article for tips on how to obtain and analyze diagnostic samples. Body cavity centesis is a valuable and effective treatment for removal of large effusions. Although veterinarians generally perform centesis, it is important for veterinary technicians to be knowledgeable about the techniques used to properly prepare, assist with, and monitor these patients. Information on pain management and assessment in veterinary patients has grown tremendously. 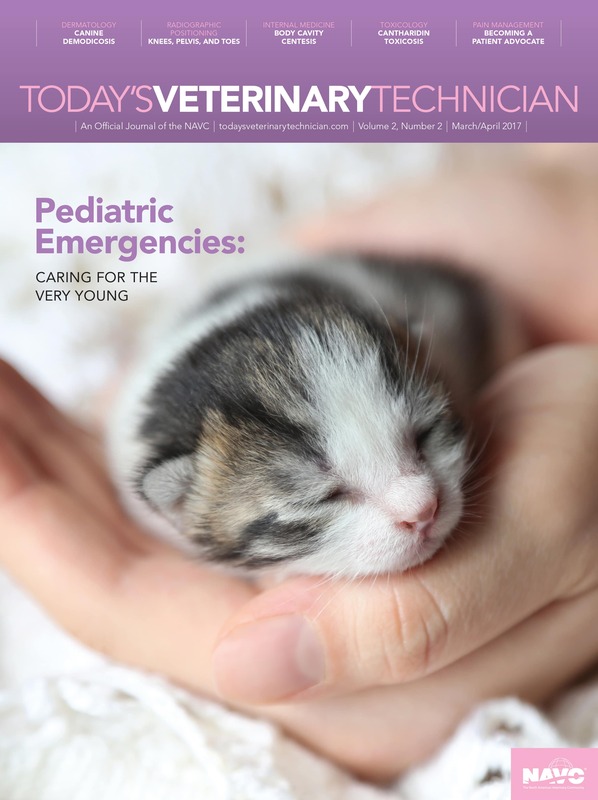 This article provides an overview of common pharmaceuticals as well as advanced multimodal techniques to help veterinary technicians realize their role as patient advocates in minimizing pain. Neonatal and pediatric patients differ significantly from their adult counterparts. Veterinary nurses and technicians must understand these patients’ unique physiologic differences and how they affect diagnosis and treatment of emergencies. This second of two articles on radiographic positioning provides an overview of proper patient restraint as well as techniques to obtain good-quality radiographs of the stifles, pelvis, and phalanges. This year, the NAVC Conference settled into a new home. Next year, it settles into a new name! Find out what happened this year and how the NAVC is already looking to the future. Blister beetles, also known as Spanish fly, contain a toxic substance called cantharidin that can severely injure or kill horses. Learn the signs of cantharidin toxicosis and preventive measures for owners.